IMO the horizontal expansion is the more important part of the game - it increases the difficulty in that you can't just camp in one spot and easily pick off whole columns at a time like in Space Invaders and Galaxian. Another vote for the horizontal expansion. The vertical one would be nice, but I can live without it. The NES version looks ok without using it, I think. Looks great ! And I support idea of keeping proportions as close to arcade as possible. The arcade game and the NES have it easy, because it seems they have hardware to flip any sprite horizontally and vertically. They have double the horizontal resolution of the A8, but use one quarter of the data, so in the end they use half the memory needed for the A8 version. Well, a lot less if you add the sprite masks (that the A8 needs for properly masked sprites). If you go for all the sprites, that is something like 292 frames of 32 bytes (assuming 8x16 pixels, G15), so 9344 bytes. If you want pre shifted sprites that means adding 14016 x 3, for a total of 51392 bytes (just the ships). Then you need to add the masks (or just use xor or replace, to draw the sprites). A version for 64K probably would need to use less rotation frames and no pre shifting. A version for 128K could use pre shifting, but would need less rotation frames also. Well, at least when you have the data in G15 mode, generating different draw methods is pretty easy. I always wanted to do a demo with just the challenging stages. Would be enough as a proof of concept. Another way to get that data could be to look at the Mame driver for Galaga. the data written to those registers every frame. Or go for the Space Harrier way..
#4119963 Moon Patrol hack ! I'm just a graphics guy that recently (a week ago) learned to hack them into games !! So it's beyond my capabilities I'm afraid..
More now that you can have your own levels..
A new proposal.. well mostly what I would do if I had all the time in the world x). Using 4 colors to display all the graphics in the game works pretty good, because that seems to be a limit of the hardware (4 colors per sprite). Later, with the game already running, you could decide what to do with all the player/missiles. Like use them for the layer of stars, the hud, the player's ship, to add color to some enemies (like the top ones), for the tractor beam, etc. You probably could add colors via DLI's to the stars, without the need to use WSYNC, so that would be pretty cheap in processing time. The normal arcade screen has a resolution of 224x288 pixels, and you need at least 236 scan lines to display the top enemies and the player's ship. That's a number the A8 could display in theory, with overscan (in normal mode Altirra can show 224 scan lines). (by skipping them in the display list, adding LMS instructions to jump over them). Then you could offer the player some configurations like "full" screen, removing 8 lines, removing 16 lines, etc. And you wouldn't need to change your sprite code, it would be totally transparent (memory would still be continuous). Another option to remove a line could be alternating it with the next line, every other frame. Kind of a compressed interlacing, also just by updating the display list. You could also offer quality vs speed options to display the sprites, like properly masked, using xor, or just plain byte replace. With more memory (or a cart version), you could go for precompiled sprites. In X you have half the resolution, with 112 G15 pixels, so narrow field is good enough. (with a dark grey background, that could be done with a couple of missiles). This could complicate side clipping, but that's a problem for another time x). Why using the arcade resolution? .. mostly to use the original movement patterns and logic. Also, no home version seemed to have used it, so the A8 conversion would be something special. Well Namco already did the work to convert the arcade code (three Z80 processors) to 6502, with the NES version. enemies at the top. Still, the game feels pretty similar to the original. 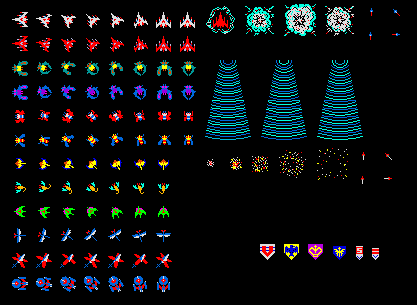 This is an "old" experiment to use char based software sprites, with source included. Plus a nice intro using pcm 4+4 samples, with the screen on (the only reason for this to use a 1MB cartridge). - 10 cars with logic to check collisions and move through the maze, every car with a different speed and acceleration. - char based, pre shifted and pre compiled software sprites (with sizes that changes between 2x3, 3x2 and 2x2 chars). - full copy of the background and proper masking for every sprite. - NTSC, 60 fps, with free time to do 1 or 2 more cars probably (more in PAL). - double buffered screen (40x25, antic4 graphic mode) and font. - some DLI's used through the screen, to add extra color (no interleaved fonts). I did a second version of this, but without using pre compiled sprites. Reading the data from tables I could display 7 cars in more or less the same time (not bad I suppose). But after my experiments with software sprites years ago, I was a little disappointed with the results that I got. I mean, using software sprites in a bitmap mode is a lot simpler and probably faster in some cases, than using the same resolution in a char mode. than using those same sprites in graphic mode (in average). And in general you are going to move more memory in a char mode, for sprites of the same (small - medium) size. do font animations without touching the screen data. And restoring the screen ("erasing" the sprites), should be faster than in a graphic mode. Probably with bigger sprites, using chars is a win-win. Pre shifted and pre compiled sprites use a lot of memory by definition. In this case the car has 28 frames (4 going right, 4 going left, 4 diagonals, 8 going up, 8 going down), that amounts to something below 12KB. include the empty space at the start and end of the car (to pad to the height of 3 chars). I did it like that just because it was faster and easier to implement. The pre-shifted frames are also used to have the tires animation, so they have more reason to exist. If you dont want to use math, use images! And the full source code is available (6502). It has some equations with sin and cos, but they seem to be only precalculated tables. The amount of memory needed could be a problem with this technique, but maybe it could work well with lower res maps. I did some experiments with the screen "on", sometime ago, and this is one of them. Music was provided by Rybags, from the RoadBlasters arcade game (who has a Yamaha chip and a Pokey ). Source and 1MB carts provided.. (NTSC and PAL). But I don't have the cpu time to activate the players for now. The code can play different tracks, in a sequence set in a table, so maybe it can be useful for someone. Colors are done using a table indexed by VCOUNT. Samples played using PCM4+4, at 8 bit depth, and 15720 Hz (one sample per scan line). After that post, Extra mode was added, and that is more like a "tower" with 2 levels per "floor"
mmlv6_pal_rh sounds pretty impressive on real hardware: just tested it on the 1088XEL using my Ultimate Cart. I'll try to record it through the capture dongle if I get time, since the camera hasn't really been doing these things justice. Background noise is pretty low. Any chance of some raw stereo files for the IDE player or some code samples? I doubt I can do better than 44KHz per channel, so stereo on the IDE player may require the bitrate to be chopped in half on each channel. My examples are for 15.7 KHz approx. and 8 bit depth, don't know if that works for you? That's one sample per scanline, using wsync. I also interleaved the data, first a 4K block for the left channel and then a 4K block for the right channel, for every cart bank. I would clean the code and put it here later. Would you say that there is more noise than what we get in Altirra? How do I load a file into Altirra? I'm running a bottled version on my iMac. I don't have any experience with the mac version, but I assume that drag and drop or "Attach cartridge.." don't work? Yes, in the case of my examples first you need to mount the bin in Altirra as a cart type "42*: MaxFlash 1M .. (bank 127)". After that you go to "Save Firmware / Save Cartridge" and save it as a ".car" file. You can also mount my examples in Altirra as type "*MaxFlash 1M .. (bank 0)", but then you cannot save them as a ".car" later. Those wonderful moments where you are finishing your code and try a final improvement, that just move your critical path code over the 105 cycles per line. Then you cannot live with the imperfection.. so you end moving all the code to page 0 just for 6 extra cycles. Then a new sample (from Marble Madness arcade), that clearly shows the stereo effect. I tried to have the smaller delay between changing the left and right channels, but I really don't know if that delay could produce some kind of audio artifact or not. Well, this is real stereo, but the effect is kind of subtle. Will try a better sample later and with less noise. I did a quick test with the same song playing in both channels (left / right) and at least in emulation it seems alright. So, can someone test the "_rh" versions in real hardware (1 MB carts for NTSC or PAL)? Probably would try to do a real stereo test later (is a little more complicated, but should not be much more). The "_emu" versions sound good in Altirra with the stereo configuration (and louder than mono).